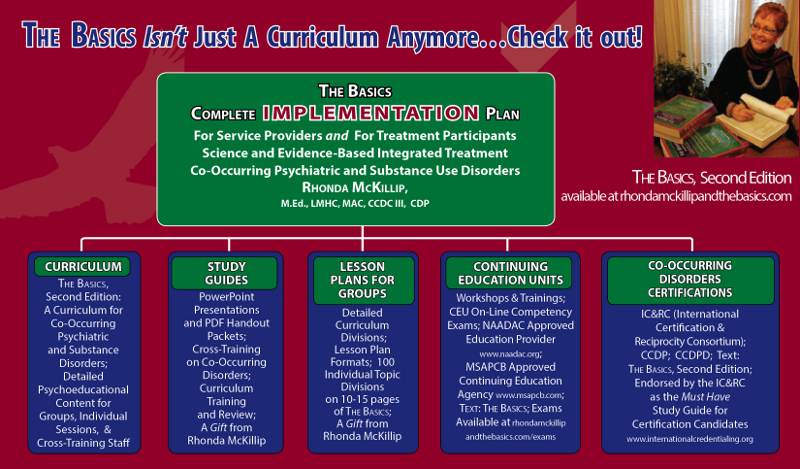 Rhonda McKillip and THE BASICS - A Curriculum for Co-Occurring Disorders Psychiatric and Substance Disorders. A Curriculum for Co-Occurring Disorders Psychiatric and Substance Disorders. Continue to The Complete Implementation Plan…. How do I describe THE BASICS? Sometimes it is called a reference book, others call it a Study Guide for credentialing and licensing. I have frequently asked questions about specific topics like "Are going to upgrade the material to match the DSM-5? ", "Is there going to be a Third Edition, is a CD available?